Brunei with its capital Bandar Seri Begawan is located in Asia (Southeastern Asia, along the northern coast of the island of Borneo). It covers some 5,766 square kilometers (slightly smaller than Delaware) with a population of 443,593. Malay and English are the languages spoken by people in Brunei. Did you know that Malaysia is the only bordering country. The Sultanate of Brunei is a small but rich country located in Southeast Asia. Brunei is officially an Islamic state, with many large beautiful mosques across the country. Sale of alcohol is banned. Bringing in meat, (other than seafood) which has not been certified halal, (slaughtered according to Islamic law), is also banned. During the fasting month of Ramadan, many shops and restaurants will be open. Brunei's climate is semi-tropical, and Bandar Seri Begawan's is sub-tropical. The temperature ranges from 14°C to 33°C - January being the hottest month. There are no typhoons, earthquakes, severe flooding and other forms of natural disasters to contend with, and the biggest environmental issues is the seasonal haze resulting from forest fires (that is caused by illegal clearing of land) in nearby Indonesia. Nationals of Israel are not allowed to enter Brunei, though other passports containing Israeli stamps and visas are not a problem for entry. The terrain is flat coastal plain rises to mountains in east having hilly lowland in west. The average density of population is about 77 per km². The climate in Brunei can be described as tropical with hot, humid, rainy. Possible natural disasters include typhoons, earthquakes, and severe flooding are rare. To reach someone Brunei dial +673 prior to a number. The local cellular networks are operated on 900 MHz, 3G, 4G. Websites typically end with the top level domain ".bn". If you want to bring electric appliances (e.g. battery chaarger), keep in min the local 240 V - 50 Hz (plugs: G). The sign for the locally used currency Dollar is BND. 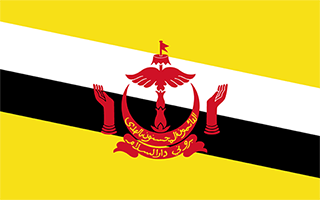 Yellow with two diagonal bands of white (top, almost double width) and black starting from the upper hoist side; the national emblem in red is superimposed at the center; yellow is the color of royalty and symbolizes the sultanate; the white and black bands denote Brunei's chief ministers; the emblem includes five main components: a swallow-tailed flag, the royal umbrella representing the monarchy, the wings of four feathers symbolizing justice, tranquility, prosperity, and peace, the two upraised hands signifying the government's pledge to preserve and promote the welfare of the people, and the crescent moon denoting Islam, the state religion; the state motto "Always render service with God's guidance" appears in yellow Arabic script on the crescent; a ribbon below the crescent reads "Brunei, the Abode of Peace".